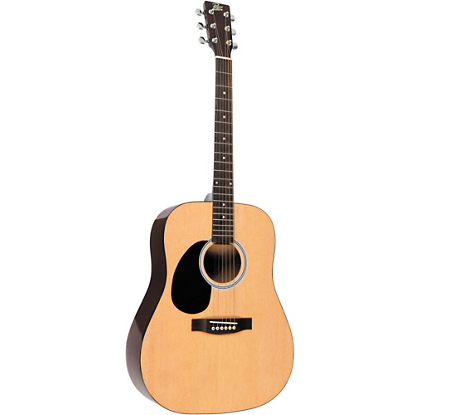 If you are Looking for a quality acoustic guitar to learn guitar or to replace your old one under budget price, you are at the right place. As a Learner or as a professional guitarist everyone deserves a quality guitar and to buy a best quality guitar you need to go through a lot of variety but to choose from them is kind of a dilemma for anyone. So to ease it for you LearnUrGuitar shortlists and gives you the list of Top 10 Best Acoustic Guitar Under 100$ . Neck width at body: 2-1/8"
String spacing at saddle E-E: 2-1/8"
Width at Upper Bout: 11-3/8"
Width at Lower Bout: 15-3/8"
Width at Upper Bout: 11-1/8"
Width at Lower Bout: 14 5/8"